Snow White never looked so sweet street. Once Upon a Time, we witnessed the appearance of Star Wars characters on not one, but two runways and eagerly wondered if there would be a third. Why? Because the unofficial rule of fashion is that three makes it a trend. And while Paris fashion week has only just begun, in an interesting twist designers Maria Grazia Chiuri and Pierpaolo Piccioli may have already delivered on the real trend here. No, it's not a Star Wars collection, but much like Disney had approached the designers of Preen for collaboration, it looks like Mickey's Marketing Team had their hand in the hig-end pot once more (<---interpret that as you will). The result: The Ultimate Snow White Collection for the modern urban princess. The very point of RED Valentino, is that is a modern fairytale collection. It's for the girl who wants to feel like a princess without wearing a costume (though the designers get very close to it, and to me is actually a plus). Which is why this collaboration could not have been more perfect. It has all the charm and whimsy that you expect from the collection, yet stops itself from getting too cutesy with the addition of edgy, modern elements, like a leather biker jacket and clear trench. A carry-over trend first spotted at the Valentino and Burberry Spring '13 shows. 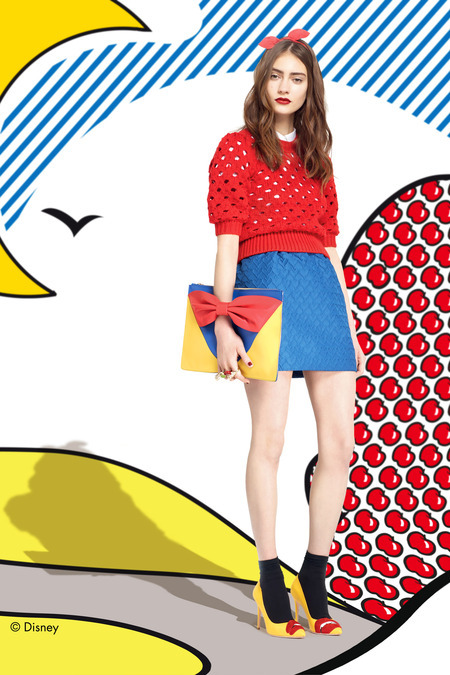 We even see the theme carried throughout the collection via the return of roy lichtenstein-like popart prints and intarsia knits, a la 3.1 Philip Lim's pre-fall 2012 . Primary colors are your friends, people! RED Valentino's Snow White collection is a fresh, fun and welcome retelling in exceptional fabrics and bewitching details. Also, I'm a girl. I like bows on things. Now speaking of details, do mine eyes deceive me or is there a hidden Mickey in those hearts...? Japanese Pop Artist Extraordinaire Takashi Murakami is no stranger to collaborations. In fact, his international renown in the west can probably be attributed in part through working with other artists and designers. Who could forget those iconic, highly covetable Louis Vuitton collaborations? And how many of us discovered the artist only after studying that surreal, eye-catching cover for Kanye West's Graduation album? Well, this holiday season, we'll have the opportunity to get our hands on a piece of his latest collaboration with Japanese beauty brand Shu Uemura. Why should you care? Well, aside from it being great product, with beautiful packaging, you guys.... it's totally anime themed! If you're a fan of the "majokko" or magic girl, (HELLOOOOOOO, SAILOR MOON!!!!) You're going to want a piece of his tribute to the sub-genre: 6 Hearts Princess, or 6HP. Beyond cosmentics, Murakami, being his remarkable visionaire self, has created a fully realized world. Telling a story in an anime ad campaign for the line! Take a look at the world of 6 Hearts Princess below, then get a closer look at some of the product. The holiday collection explores the dual nature of every girl. Or, the "pink side", and "black side," as sung to us in the promo video by, yup, you got it, the one and only Hatsune Miku herself! You've got the option of indulging either or both sides with either palette. Whichever you choose, you'll get to work with some brilliantly pigmented, soft shimmering shadows. But don't take my word for it. Laura Lou Beauty has a brilliant in-depth review of the product, along with some spectacular beauty how-tos! How awesome was that PV? Well, if 6HP looks like an anime you'd actually want to tune into all the time, guess what? Come 2014, you will! Have a look at the PV for the show below, then go get your hands on some of this magical, ani-makeup. Oh yeah, I said it! TREND ALERT: From Lunchbox to "Tin Tote"
Low and behold, shortly after the editorial was published, I took a trip over to Atlantic City and found myself in whimsical candy and novelty shop on the boardwalk called “IT’SUGAR” . Not 10 seconds into browsing this cute shop by the sea did I spot the first of them. CUTE. RETRO. 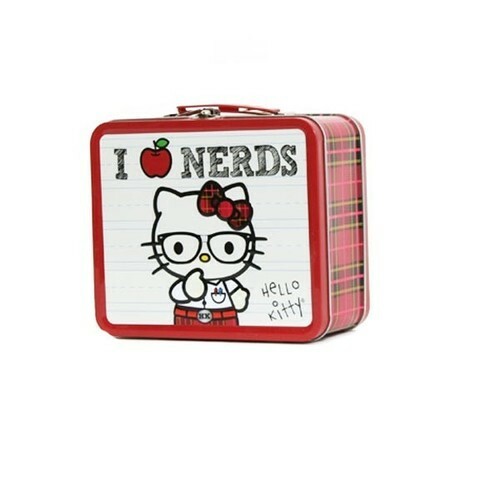 (SUPER GEEKY) LUNCH BOX! It was love at first sight for me, and though I didn’t succumb to the impulse just then, they’ve recently opened a Coney Island location, so my bank card will be seeing more action very soon. 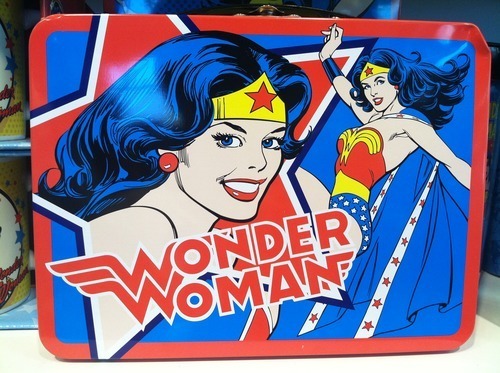 Wonder Woman tin, I’m coming for you. Fortunately at only $18, you’re not exactly breaking the bank. Which is great, considering I may need more than one. SO many options!!! Check out the site for yourself, or better yet, find your local store to really get the full experience. 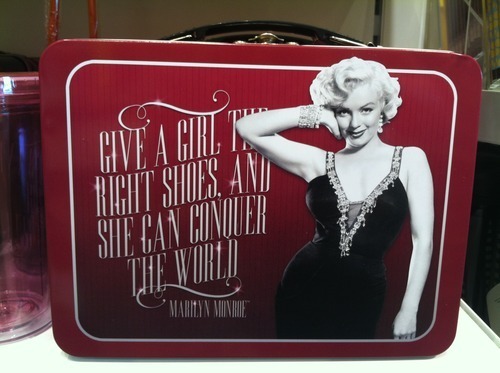 GET UP AND GO to find more great “tin totes” to add to the bag collection, then ponder what to put in each. Note: Not my fault if you end up buying all things in-store. It’s awesome and you’ve been warned. 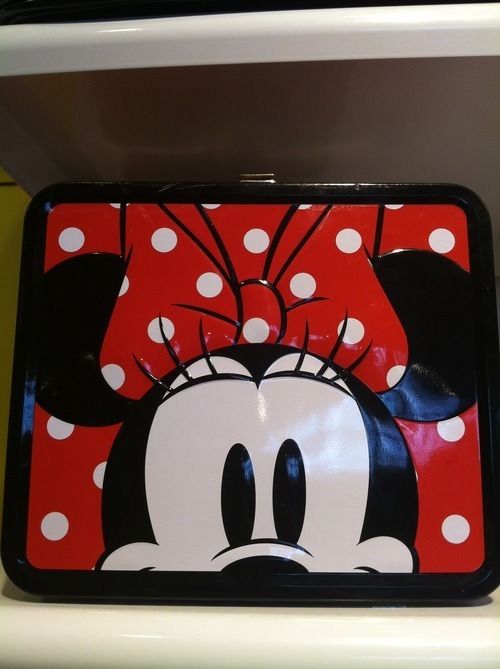 Additionally, browse the eclectic collection of vintage lunch boxes over on Etsy. CONSIDER: This might be a cute carry all for Comic Con Day 1. Before you get that MASSIVE WeLoveFine bag, that is. Which oddly enough you can then take back to IT’SUGAR and fill with their equally larger than life candy.